This week we venture off the islands, and on to the mainland of Scotland, to Speyside. The Macallan Distillery sits on the banks of the river Spey and has been producing whisky there for nearly two hundred years; today’s choice is a little younger than that! This is their 12 year old, matured in sherry casks. 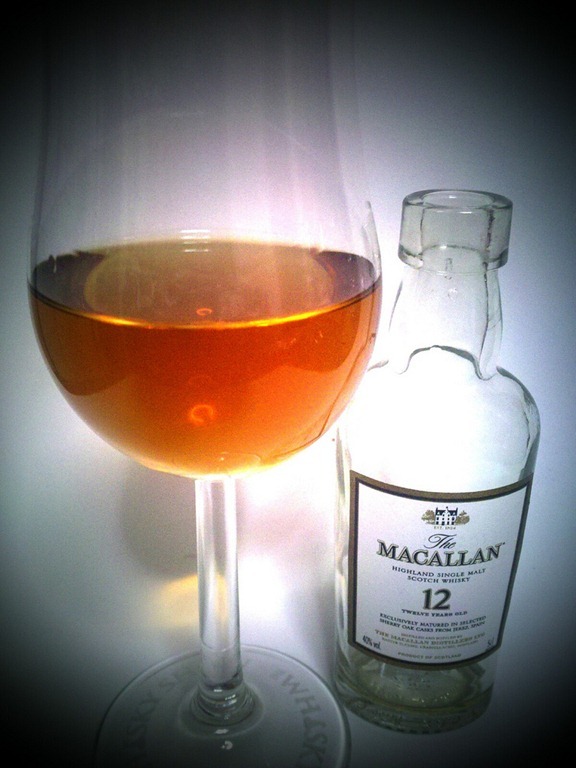 Unusually in a world filled with whisky ‘finished’ in various casks, The Macallan spends the whole 12 years in the sherry wood, giving it a nice rich colour. The nose is curious; there’s some sherry sweetness and a hint of marzipan. With water, those fade and the oak is more noticeable, with hints of honey. On tasting, there’s a surprisingly summer fruit flavour, again with honey notes. If anything that fruitiness deepens with the water – a richer, quite raisin-like taste. It doesn’t have a particularly long finish aside from the alcohol, but is a nice easy drinking whisky for all it’s richness. It’s not a truly great whisky, but it is a damn good one.